S (Scripture): Romans 4:13 For the promise to Abraham or to his descendants that he would inherit the world was not fulfilled through the law, but through the righteousness that comes by faith. 14 For if they become heirs by the law, faith is empty and the promise is nullified…20 He did not waver in unbelief about the promise of God but was strengthened in faith, giving glory to God. 21 He was fully convinced that what God promised he was also able to do. 22 So indeed it was credited to Abraham as righteousness. 23 But the statement it was credited to him was not written only for Abraham’s sake, 24 but also for our sake, to whom it will be credited, those who believe in the one who raised Jesus our Lord from the dead. 25 He was given over because of our transgressions and was raised for the sake of our justification. O (Observation): Paul is starting to dig a bit deeper into the identity of the Jewish people. Over time, they have become convinced that the works of the Law made them who they were: God’s people. Paul is helping them to see that Abraham’s faith in God was not a work of the law, but rather, came about as a gift of faith that originated in God, and thus allowed Abraham to believe at all. Salvation came to Abraham NOT because he performed a “good work” by believing. Rather, seeing the blessing available to him and Sarah, he responded to the blessing by actually believing in the blessings to come. Salvation came to Abraham OUTSIDE OF his own doing. He recognized that, and ONLY THROUGH FAITH APART FROM THE LAW did Abraham believe. Faith was the key to Abraham’s salvation and blessing. The same goes for those who believe in the one who raised our Lord Jesus Christ from the dead. Paul tells the Jewish Christians in Rome: just as Jews credited faith in God with Abraham as a model of faith, so too is the opportunity available for ALL to believe that God raised Jesus Christ from the dead, apart from any understanding in the Law or Jewish customs. In other words, Gentile Christians have just as much opportunity to be a part of the Church as Jewish Christians. A (Application): I have learned from Mike Breen’s book on discipleship, Building a Discipling Culture, that our identity as Christians stems not from our work towards God, but in God claiming us and bestowing faith upon us. (This is illustrated in the triangle picture above.). Once that identity in God is established, then we are able to do the work that God calls us to do. The summation of this, found in Breen’s book is this: God >> Identity >> Obedience; God is the originator of our identity, which leads to our confidence to be obedient to do God’s work (albeit imperfectly). 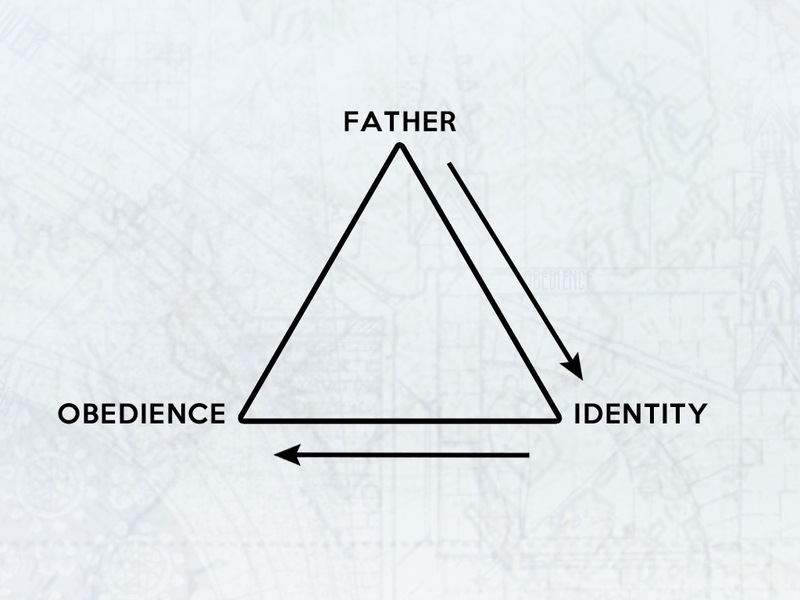 Obedience leads to >> Identity as God’s children >> which then grants us access to God. This breaks down when you think about all of the times that we slip up, like when we are angry at someone and speak ill of someone or when we blatantly sin in any way (we’ve all done this, unfortunately). In this sense, we are always exhausting ourselves to stay in God’s good graces. Yet this is not the way that the Scriptures describe our relationship with God. God claims us >> that we might be indentified as God’s children >> that we might be obedient to do God’s deeds. Abraham was chosen by God. Abraham knew (through faith alone) that God would bless him and Sarah and that he and Sarah would be a blessing to others. Then God brought about righteousness through Abraham’s lineage. May we know that God has chosen us and that God can choose to help anyone believe…even those who might not look and act like us…who might not speak our language…who might live a different part of the world. P (Prayer): Lord, help us to see that the path to you is by faith alone. Amen. This entry was posted in 3DM, Digging Daily and tagged 3DM, Abraham, Faith, God, Identity, Obedience, Sarah. Bookmark the permalink.